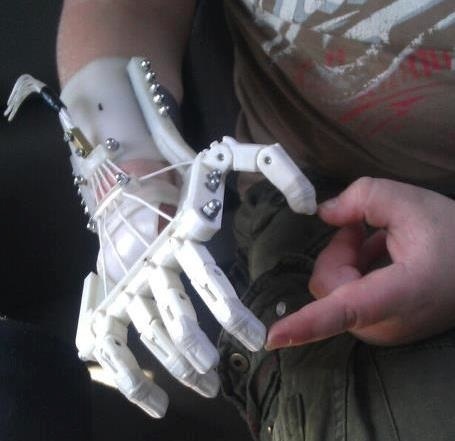 #maketheworld Some things you should know about Robohand devices #3DThursday #3DPrinting « Adafruit Industries – Makers, hackers, artists, designers and engineers! Important to consider when rolling up your sleeves to participate in the Open Prosthetic movement: a few of these details posted by the Robohands team about the special materials and steps that they incorporate into functional assistive devices. Some things you should know about Robohand devices. …Robohand uses medical Orthoplastic that is custom molded to the wearer to limit the possibility of skin lesions, infection and injury. The Orthoplastic used by Robohand is breathable, washable and medically approved for this type of use. A Robohand device is custom fitted which adds to client comfort. A proven statistic is 25% of people with prosthetics do not wear them due to the fact they are uncomfortable. Using medical Orthoplastic ensures Robohand will remain medically fit for use and long term wear. Robohand uses stainless steel hardware that is less likely to fail or break, does not rust or discolor and decreases the risk of infection/injury. Dome nuts are used to decrease the likelihood of injury to yourself or others. Stainless steel is more medically appropriate than cheaper hardware. Many of our clients like to swim and bathe in their Robohands and the stainless steel does not rust or discolor….